This entry was posted on Thursday, February 12th, 2015 at 10:41 pm	and is filed under All the other stuff. You can follow any comments to this entry through the RSS 2.0 feed. You can leave a comment, or trackback from your own site. Brilliant! Well said, my friend. Exactly the same line I heard from Big Charlie when expressing frustration that I wasn’t getting the distance I wanted. 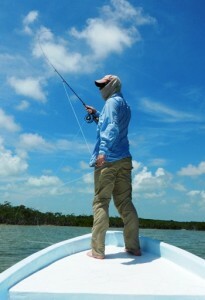 He added an additional point: Get that hauling hand back up to the reel/other hand FAST. No, it should be so fast that you throw slack in the line, but it should get there BEFORE the casting hand starts moving forward. I contemplated this for a while and think it can be distilled into a rule: During the casting stroke your hands should never move toward each other. Keep it up, my friend and hope we can fish together this June! Fishing together in June would be so awesome. We need to get some of those days nailed so we can make sure it happens.